Another Wednesday rolls around and of course that brings me as always to What I Ate Wednesday hostessed by the lovely Jenn at Peas & Crayons. Life is crazy interesting here at the moment, but few things keep me from jumping right into the WIAW pile and sharing food and fun with all of you. Be sure to check out the other foodies when you’re finished here and leave some comments. Yes, we’re still working on Sensible Snacking and of course, I’m still failing miserably, but Hey…at least I’m showing up! Last week I raved about doing food photos with my new DSLR which I love. The only trick is that it eats up a LOT of space on the blog, so until I can figure that out (Kristen…I need another tutorial…) I’ll be using my point and shoot. We’ll all survive. 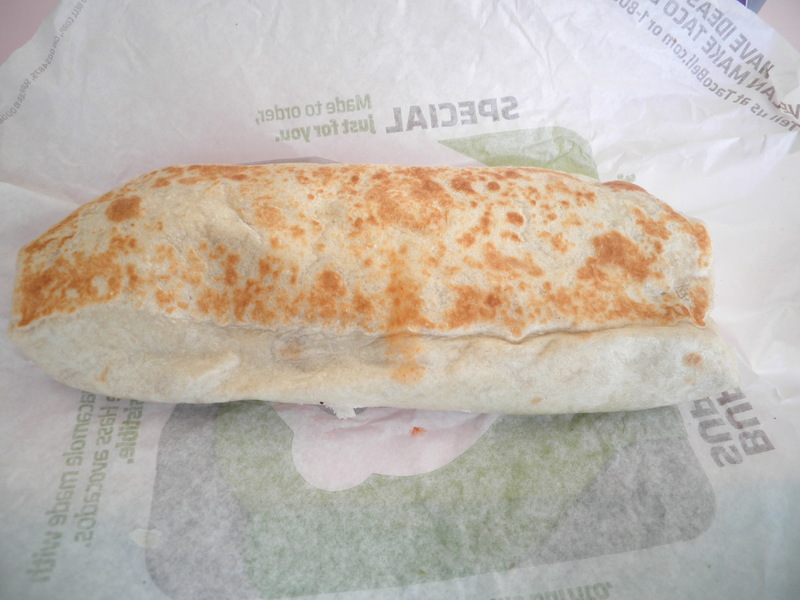 I eat these far more frequently than I show them…Taco Bell bean burrito. They count for 9 Points on Weight Watchers for me, but they are an extremely filling lunch. It easily holds me until dinner with no trouble. Besides, who can argue with $1.27 for lunch?! 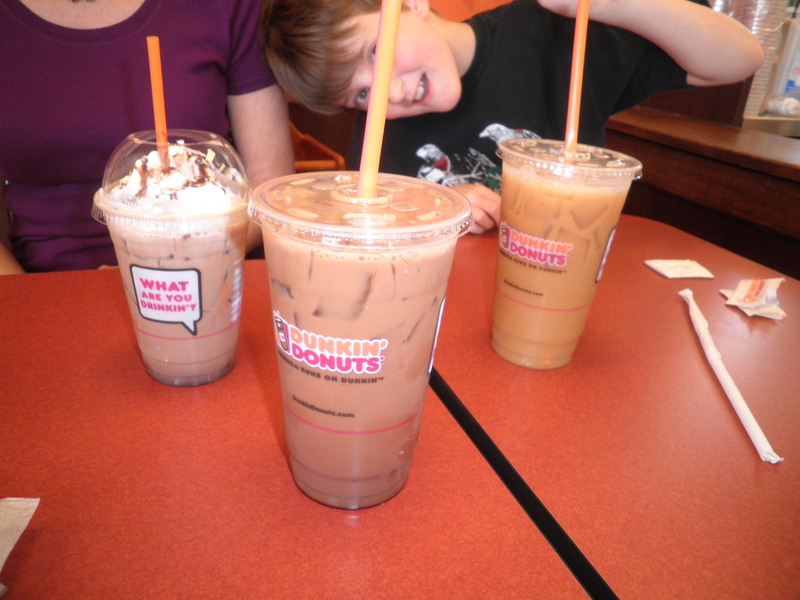 After our meeting with the lawyer on Thursday, Ele, Little Michael and I headed to Dunkin’ Donuts. I tried their current special-mint chocolate chip. It was delicious but as I post this, I realize that I never figured out the Points or added it into my day. Well, Thursday was the day I was Way off track anyway. It was So good though! 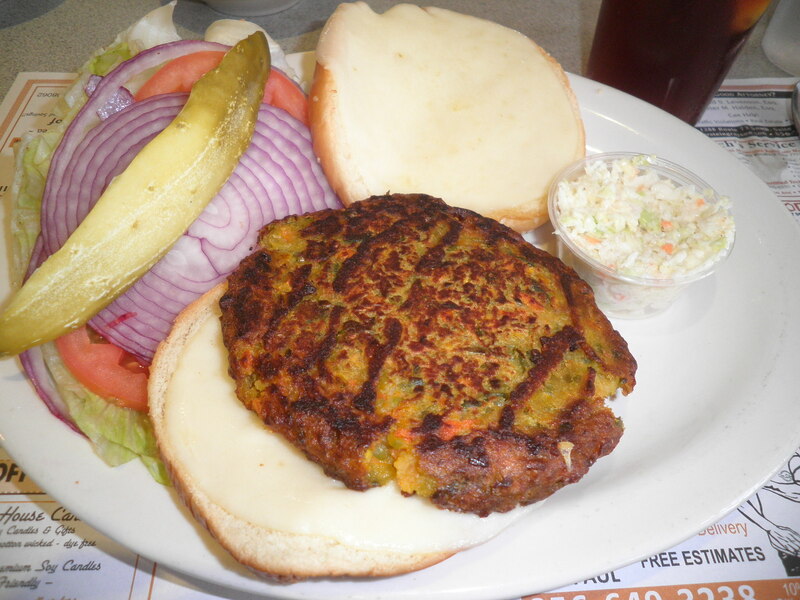 One of my new favorites…the veggie burger at our favorite diner. This really is good and filling…two of my favorite things! No episode of WIAW is complete without a trip to Ice Cream Kids. 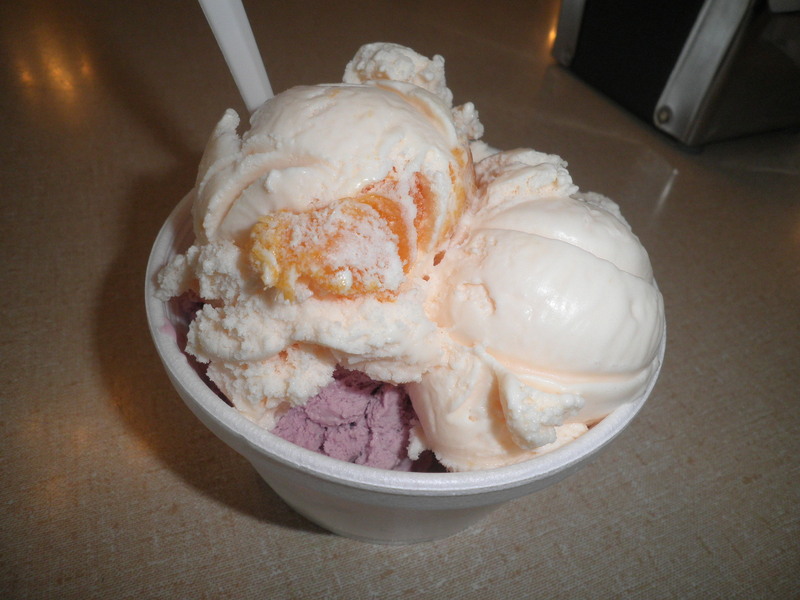 This was a combo of black raspberry and peach…SO good. Reminds me of a combo we used to buy at WaWa when Ralph and I were first dating. Yum!! 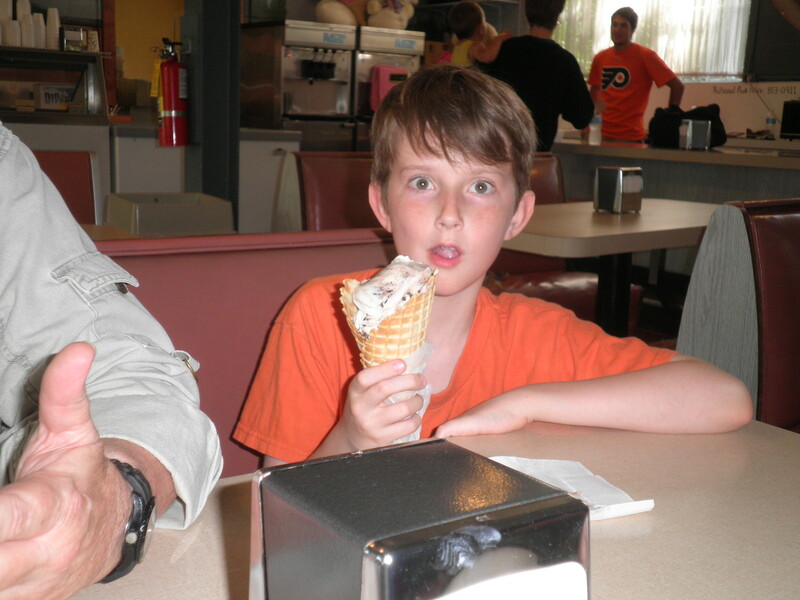 Caught him…with a cone of Moose Tracks bigger than his Head!! We went out to lunch on Sunday with Ralph’s sister Maddie and her husband George. We always have the best time with them. We went to a third diner for this lunch. 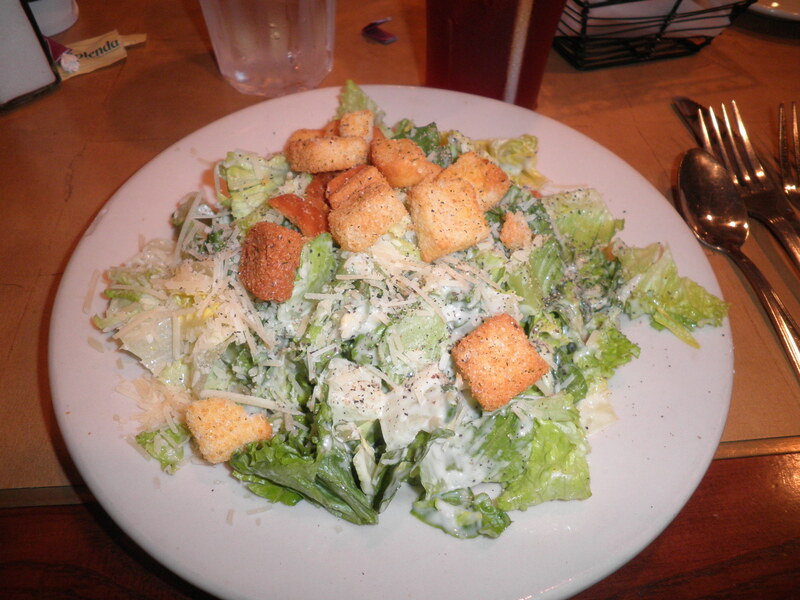 I started with a Caesar salad that was delicious! 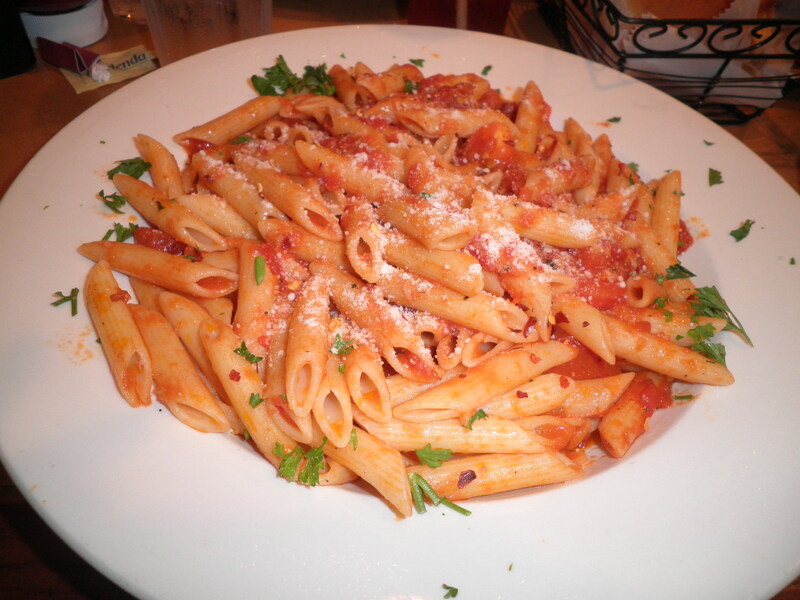 This was Pasta Arrabiata. I think that’s the spelling. I only ate about a third of it. The salad was much bigger than I’d expected. I must confess that later that night I ate the rest…well, it was my dinner that time, right?! Several times in the last week or so, Ralph has decided we’d get lunch at WaWa. 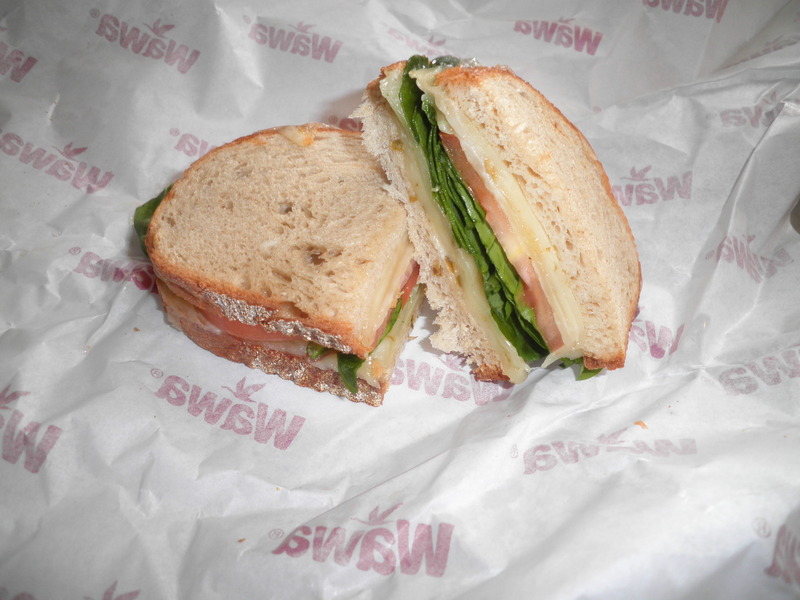 You get to make up your own sandwich here. This is my new fave…rye bread with pepper cheese melted on it, spinach and tomatoes. So that wraps up WIAW for me for this week. All in all, not a bad week, I survived it, which wasn’t a given when the week started! Be sure to check out the other bloggers posting over at Peas & Crayons and be sure to leave some comments. First a few familiar faces. 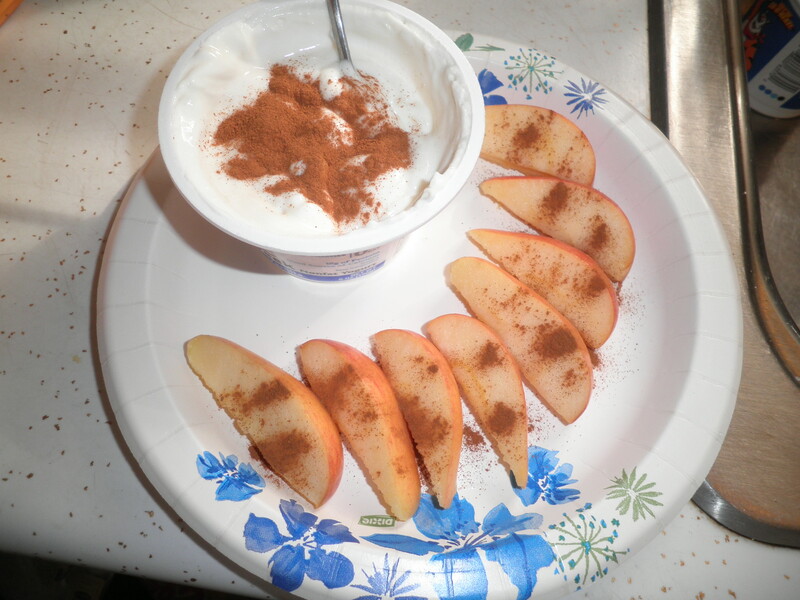 Greek yogurt with apple and of course, Cinnamon! 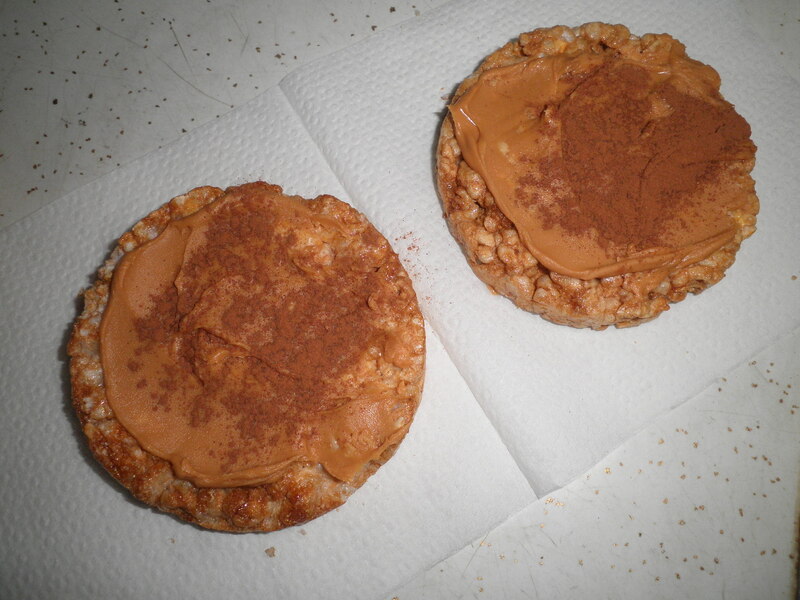 Caramel rice cakes with peanut butter and…oh, yes, Cinnamon! This is one of my favorite snacks or breakfasts or lunches. Heck, I’d even eat it for dinner if given the opportunity! 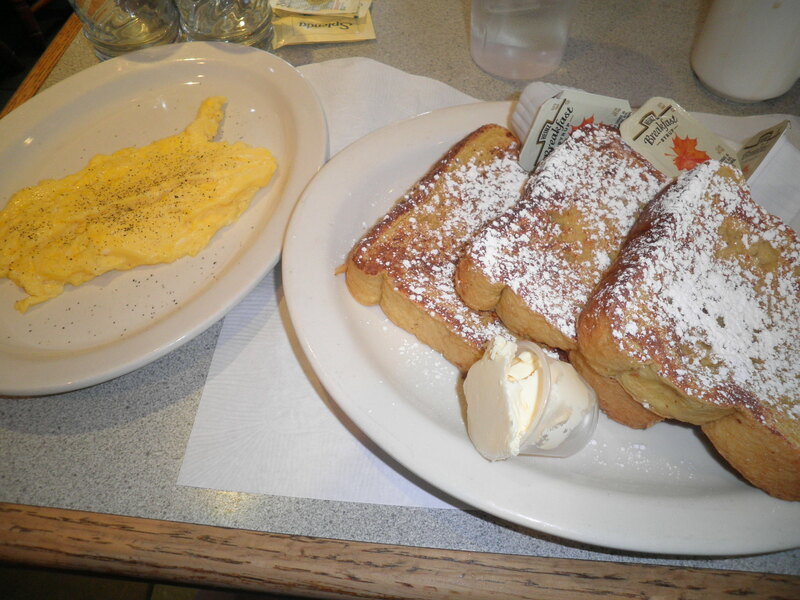 Saturday was the day with two breakfasts. First, right after Weight Watchers, Debbie, Kristen and I went to breakfast. 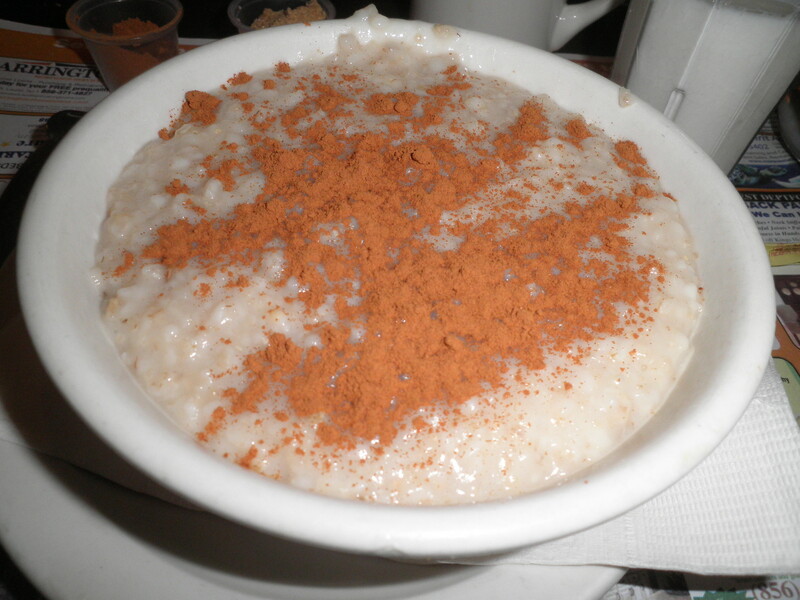 My choice…oatmeal with…all together now…Cinnamon! Second breakfast…I looked but I could not find a single Hobbit!! Only Ralph, who suggested we go even though he knew I had just had breakfast. 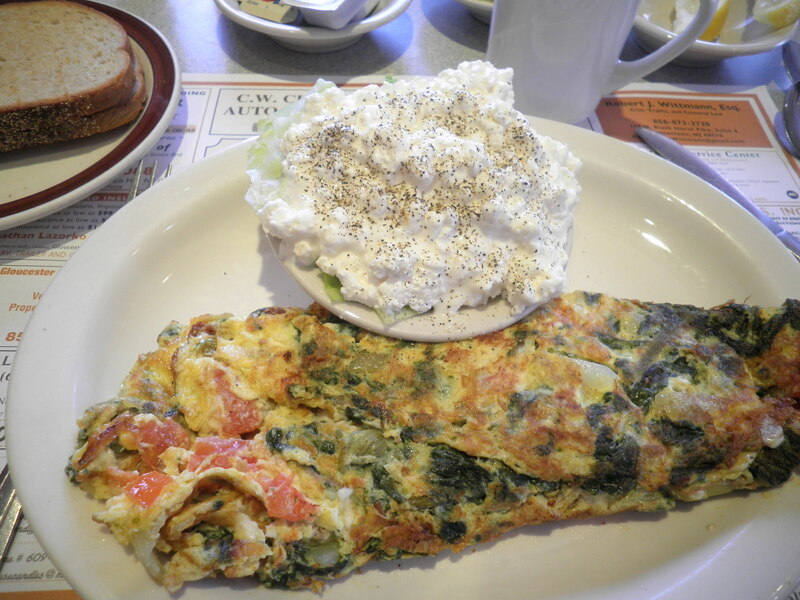 Greek omelette (tomato, spinach, onions and Feta) with my happy side of cottage cheese to replace the potatoes. There…Some veggies for you! 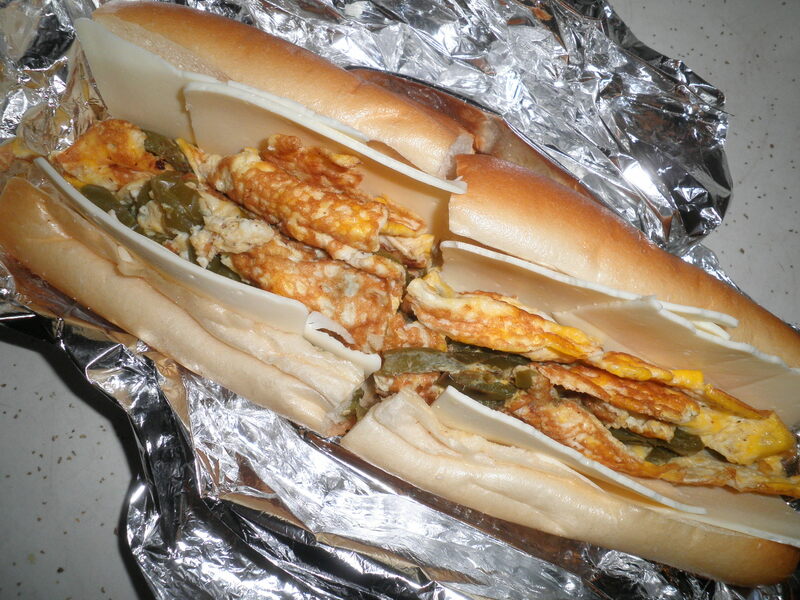 Pepper and egg sandwich, my favorite. They forgot to put on the American cheese I requested so I put my own on. Frustrating sometimes. 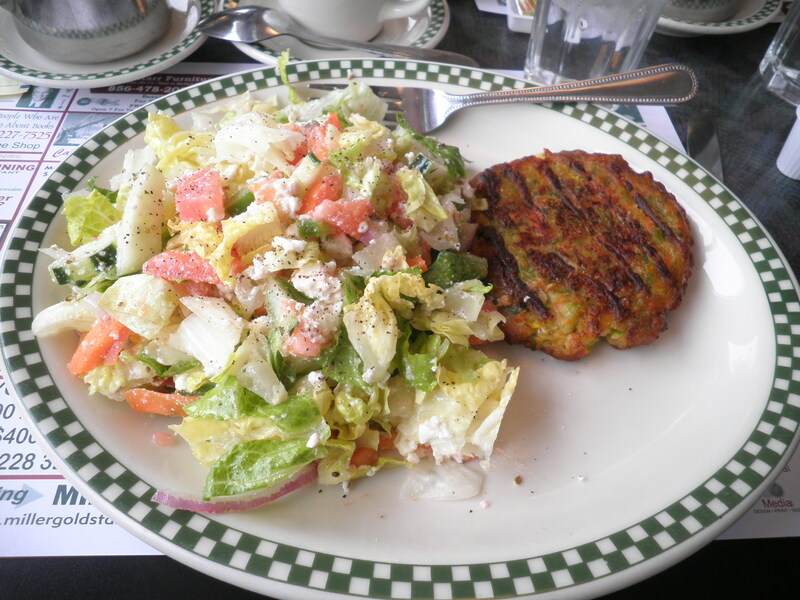 Monday took us unexpectedly to one of our favorite spots and I got my favorite menu item…the Athenia Burger. You’ve seen it before because I have it almost each time I go there. 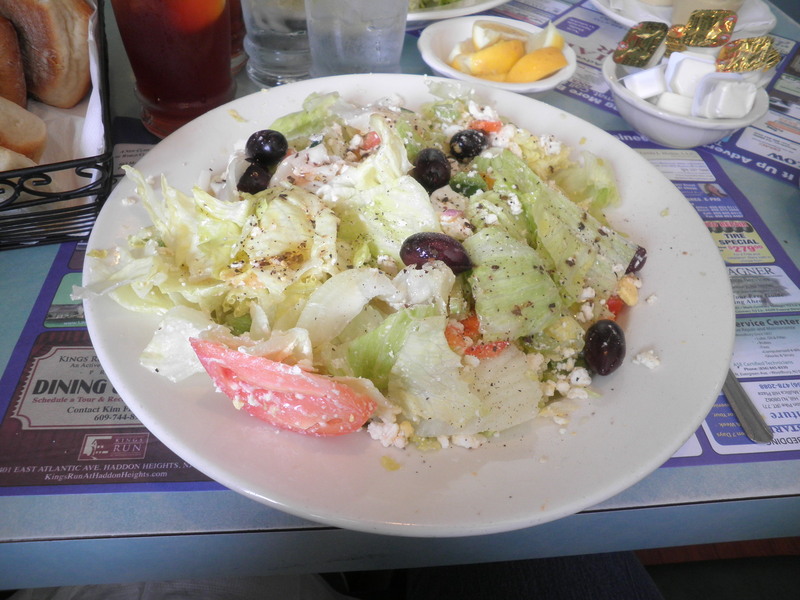 It is Greek salad with a burger…meant to be a regular burger, but they have a delicious veggie burger which I substitute. I’m never sorry…tasty and filling. Be sure to make your way over to Peas & Crayons, check out all the yummy treats and leave some comments! WIAW~Where Is The Track and Am I On It? I talk a lot about being on track or off track. I do believe I’m feeling off track this week, but that will Not stop me from joining in with What I Ate Wednesday, the fun food filled craziness created by Jenn at Peas & Crayons. I hope for Jenn’s sake and for ours as well, that she doesn’t have the technical difficulties she had last week getting the link up to work. I would be Very disappointed if I didn’t get to join the fun. When you’re finished here, be sure to check out the other bloggers who love to share their tasty treats…they also like comments, so be sure to share a few. Again, I seem to find myself with fewer food photos than I thought. 😦 I’ll have to make do with what I have. I didn’t photograph last night’s dinner because I was sure I had plenty. It’s something I plan to replicate again so I won’t worry too much about it. You’ll see it eventually. 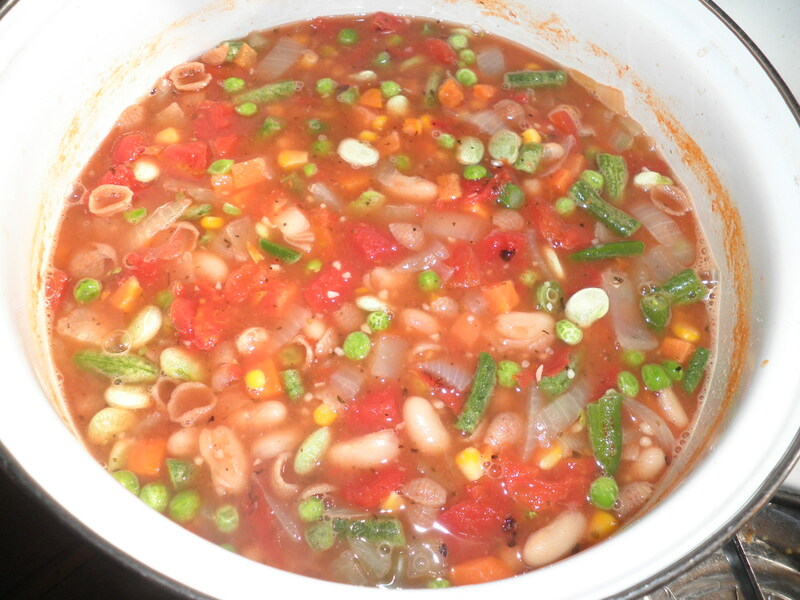 Earlier this week I made some pasta e fagioli from a Weight Watchers recipe that I shared here. It is one of my favorites and I gobbled it up pretty quickly over the next few days. Very easy and it doesn’t take long to cook, one of my favorite things! Friday, Ralph and I had to run some errands and we found ourselves at a really good pizza place in Franklinville. I like it because it offers a lot of vegetarian selections. This was a salad with provolone cheese. I only had to ask them to leave off the bacon to make this perfect. A few too many croutons, but I took a lot of them off. The little garlic knots that they serve with it are delicious. 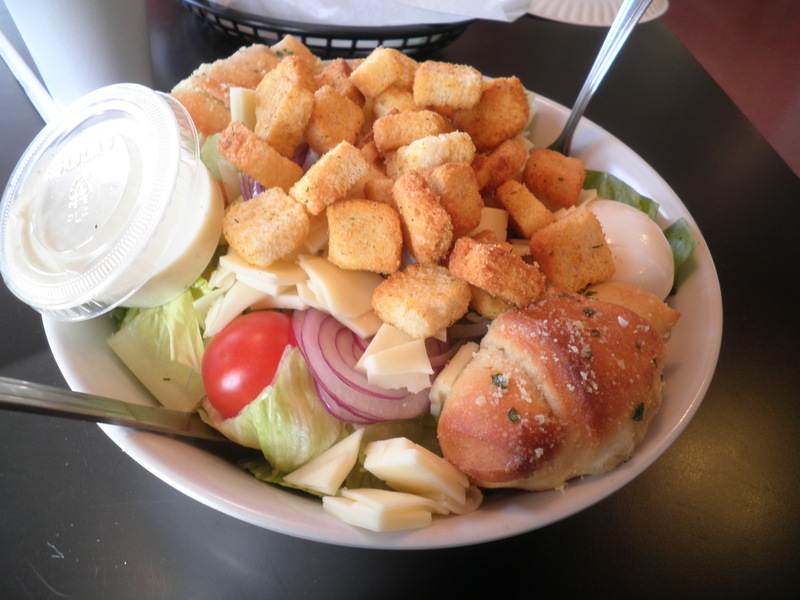 It was a huge salad and really filled me. Love finding place that offer food that I can eat! Saturday morning after Weight Watchers, Ralph decided that we needed to go to breakfast. I figured, ok, I just weighed in, I have a week to work off whatever I eat so I decided on a splurge. That’s What I Ate Wednesday for me today. Be sure to check out some other blogs over at Peas & Crayons. We all appreciate you stopping by!